The full name of Adrian Barath is Adrian Boris Barath. Adrian Barath is the latest batting star in West Indies who is showing excellent skills in his batting with in short cricket career. Adrian Barath holds the record of youngest West Indies player to score test century in International cricket. 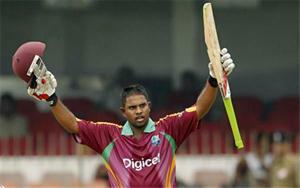 Adrian Barath was born in the year 1990 April 14 at Chaguanas, Trinidad and Tobago. Adrian Barath was playing for Kings XI Punjab in IPL cricket. Adrian Barath is a right handed bats man and right arm off break bowler. Adrian Barath made his test cricket debut in the year 2009 November 26 against Australia and hid ODI debut was against Zimbabwe in the year 2010 March 4. His T20 debut was against Zimbabwe in February 28, 2010 and IPL debut in the year 2010 March 19 against Deccan Chargers. Adrian Barath started his cricket career in first class cricket and he became the youngest player in West Indies to make first class debut for Trinidad and Tobago at the age of 16. After first few matches, Adrian Barath suffered from injuries and missed 2011 world cup. He lost many matches against sri lanka and Pakistan series. Adrian Barath just played 9 test matches and scored 4 half centuries and 1 century. More details about the profile and career performance of Adrian Barath in test, ODI, T20 and IPL cricket are given below.